Announced yesterday by Jawbone, the company is expanding their lineup of portable speakers with a thinner version of the standard Jambox. Called the Mini Jambox, the speaker is slightly wider than the original Jambox, but more than a half inch slimmer as well. Built inside a one-piece aluminum chassis, the Mini Jambox can slip into a laptop bag or pants pocket fairly easily. Similar to the original Jambox, the Mini Jambox contains two neodymium drivers, but only one passive bass radiator rather than the dual bass radiators found in the original Jambox. Identical to the other models in the Jambox lineup, the Mini Jambox connects to smartphones, tablets or laptops over Bluetooth in order to play music. According to Jawbone, the lithium-ion battery inside the Mini Jambox can play music up to 10 hours before requiring a recharge. In addition, the battery offers 75 hours of standby time on a single charge. If listening sporadically, it’s likely that a Mini Jambox owner would only have to charge the battery every couple days. Alternatively, the original Jambox offers 15 hours of music playback. 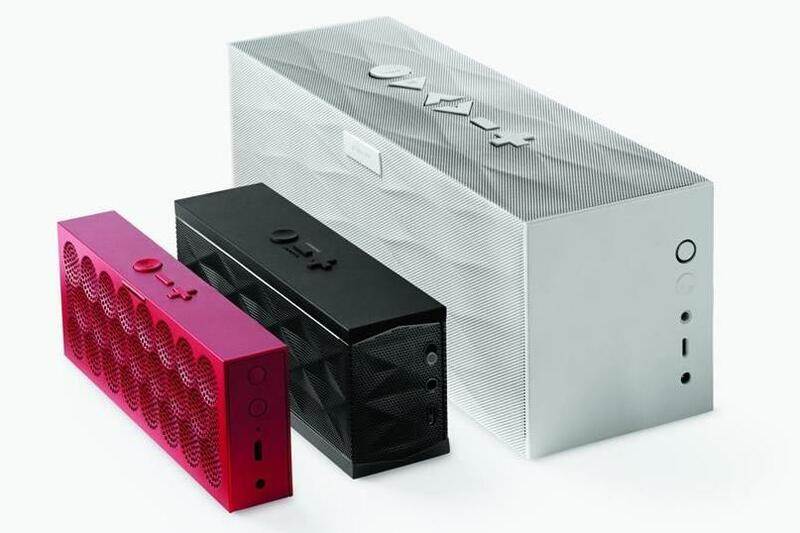 According to Jawbone, the Mini Jambox will be available to consumers in late September in colors such as aqua, blue, graphite, green, orange, purple, red, silver and yellow. However, the price is identical to the original Jambox starting at $179.99. In addition to the new Mini Jambox, Jawbone has also launched a new mobile app for iOS and Android devices that allows users to name their Jambox and provides instructions on how to use the Jambox for people that don’t quite get Bluetooth. At the moment, the iOS version of the application also allows users to import music playlists from apps like iTunes, Spotify and Rdio. According to the development team at Jawbone, that functionality is also headed to the Android version of the application in the coming weeks.